Why is Ethereum a Good Investment? How Do You Get Ethereum? How Do You Use DApps? The Flippening, that moment when Ethereum overtakes Bitcoin and has the largest estimated cryptocurrency marketshare, might be happening sooner than we thought. It appears that Bitcoin is continuing to plunge against Ethereum this morning. As of the time of this writing, at 8:49 Central Time, Bitcoin is down 7.83% against Ethereum on Coinbase. This trend has continued since yesterday. Look at that large wall of BTC exchange orders waiting to flip over to Ethereum. So, that’s good right? Ethereum is holding it’s own. True Ethereum Bulls know that this event is destined. As the vastly more useful cryptocurrency, with tons of untapped potential, Ethereum will eventually supplant Bitcoin with the number one estimated market cap measured in USD. We know that. Nonetheless, and I suppose I’m just speaking for myself, but comment if you can relate, this is not exactly how I envisioned it. I imagined a race upward, with Ethereum just barely pushing ahead of Bitcoin. The race would be neck and neck for a longtime. The fanboys on each team would have a fun and friendly rivalry where everyone wins. But, ultimately, based on dedicated efforts from the community and the beauty of the tech, Ethereum would have its day. Ethereum would earn the largest marketshare and hold it until the end of time. That was my vision: the sunny uphill race. Sounds nice, right? I did not envision that it would happen with Bitcoin being blown away by market fears while Ethereum held strong. This is the tornado scenario. Ethereum, tethered by the love and promise that its holders have for the token, has roots sufficient enough to withstand these storms. We can be thankful as a community that we have these roots. 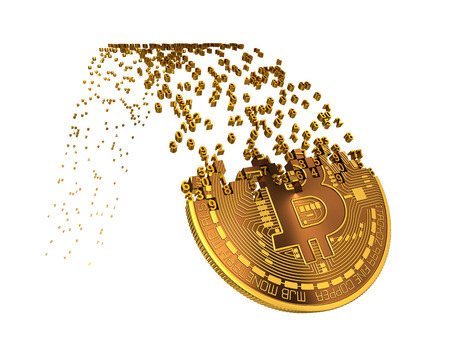 Bitcoin has roots too, but most holders are speculators, not true believers. For that, BTC’s price as measured in USD will be whipped around by these foul winds. The tornado scenario is far different from the sunny uphill race. That the tornado scenario seems to be unfolding is unfortunate. I think its fairly common to imagine that Ethereum is like Bitcoin’s younger brother. All lovers of Ethereum want to see it grow bigger than Bitcoin. Yet most of us didn’t want this to happen by a reduction in the size of the elder. I hoped to bask in the sun during the flippening, not be happy that we survived it. Well, the flippening hasn’t quite happened yet, but signs indicate that it might be coming sooner than we imagined, and under conditions different from what we hoped. Yesterday began with the subpoena of Bitfinex and Tether. This was big world news that shook a lot of investors with weak hands. The bulls pushed back. Unfortunately for those anticipating a rise in value, this major story was accompanied by another: Facebook threw a blanket ban over all ICOs and cryptocurrencies, including Bitcoin. This was probably a wise move for Facebook. They are a very large company ripe for regulation. This is their first major action against the many scams and schemes proliferating across their network. These action are good for Facebook because it was easy to accuse them of being negligent, or even complicit, in the selling of unregulated securities and the many other frauds that have been perpetrated on Facebook users through Facebook’s advertising channels. This was a wise move for Facebook and ultimately good for the Ethereum eco-system. The fewer people who are harmed by the many bad actors currently exploiting our beloved Network, the better. But in the short term, this also means less money in the ecosystem, which is going to affect the market. These reports crushed Bitcoin. The value dropped as low as the $9641.82 USD on Coinbase. I’m sure many readers of this site would have been interested in purchasing at that rate and this moment in time. So the bulls did push back and Bitcoin worked its way back up to the $10K zone. Now, here’s the interesting part. Ethereum also lost value alongside Bitcoin, but less, and Ethereum proved to find a ceiling around $1024 USD on Coinbase. The last time Bitcoin dropped below 10K was on January 17th, 2018. It dropped to $9833.17. That same day, January 17th, 2018, when fears of Asian regulation scared away some investors, Ethereum dropped to $838.69. My point is this, during the last major hemorrhaging, Ethereum bleed much worse than Bitcoin. This time around though, Ethereum held much better. I think this signifies greater investor optimism in Ethereum overall. I think it’s a good sign for the future, unless you’re trying to pick up some Ether for less than $1k. That boat might have left. Warning: Investing in cryptocurrency is risky. The above is just one person’s opinion. That person could be totally wrong and has been many times before. Invest only what you can afford to lose and do not add peril to your life by investing too much. Did you know that you can interact with the Ethereum Blockchain directly from a website? It’s true. All you need is Google Chrome and the MetaMask plugin. Once I got mine up and running, the first thing I did was what any sound-minded fan of the free press in-the-know would do: I went to Leeroy.io. When I arrived at the homepage of Leeroy.io, I was greeted with a minimalist interface. The single input box invited me to create an account. This is because I was logged into MetaMask. My identity on the blockchain had already been validated without me even noticing. They didn’t need my email address and a complicated two-way validation approach. They knew who I was right away. I was wallet id: 0xbacb58a5bd0e2df0b3d3e82a1c75ad565a417cd6 and now they just needed to associate user-provided details with my already verified ID. THAT’S PRETTY COOL! It’s ok. I only wasted like 30 cents figuring this out. Now, here’s the part where I did some dumb stuff. If you are going to open an account on Leeroy, don’t waste your gas doing dumb stuff like I did. First, I inputed a Leeroy username to associate with my wallet id. It goes without saying (but is also said) that I chose Ethereum Bulls as a user name. I suppose I grew impatient. I clicked away or refreshed or something. Then I tried to go back. I didn’t know what to do. So I made another user name, then confirmed that transaction. Fortunately it was only about 10 cents worth of stupid. In the next few moments my account existed. When I visited Leeroy.io, I had new options and a name associated with my now-existing account. My account had settled on Ethereum Bulls as a username. I suppose Leeroy resolved the conflict by throwing out the second user name that I tried to enter, though I did go back and reenter Ethereum Bulls a second time after that, so it’s hard to say. Here’s why, I am actively interacting with another writer who is really interested in Ethereum. I don’t know too much about this person other than that their website looks better than mine, and they are big into Ethereum, but we’re off to a good start. We meet on Leeroy.io? What better place to forge connections in this community? 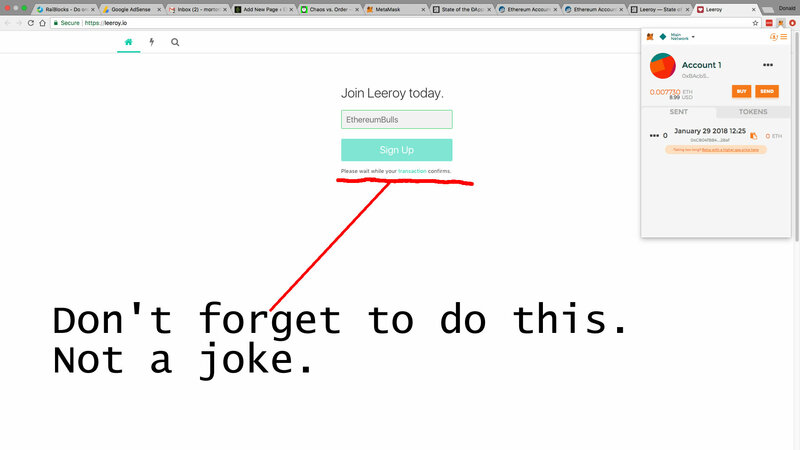 Leeroy.io is cool and really fun. I am going to keep using it, alongside standard Internet channels like Facebook and Twitter. However, I am a passionate Ethereum supporter actively writing on the topic. Callmegwei probably isn’t going anywhere either, but I think there’s just WAY TOO MUCH FRICTION for the average user. This isn’t the fault of the entity behind Leeroy.io. The development effort is VERY admirable. I am very impressed with how it works and the way it interacts with the blockchain. This, however, might not be the ideal use case of the technology. Having grown up alongside the Internet, most developers are going to have a hard time unlocking the true potential of the blockchain. We will continue to see efforts that are analog to web offerings for some time. Some of these might even be improvements over their currently-existing Internet counterparts. Leeroy does have some valid improvements over Twitter for SOME people. For example, instead of writing Hello World nonsense, a person could make an important political statement or something that will be immutable. Likewise, someone could also scrawl some hateful inflammatory content and pictures. Such activities might test one’s commitment to the notion of free public expression. Yet projects like Leeroy.io are important for us developers. Monumental. They help us see glimpses of the true capabilities of this thing that many of us are still trying to wrap our heads around. For that, I am thankful for and pleased to see an application like Leeroy.io. I look forward to continuing to grow with this hybrid web-service. Ethereum is so much more than a crypto-currency. It’s a platform for the next generation of apps that will make use of public, trustless data and digital assets. Crypto currency is just the first app that runs on the Network. The amount of apps and programs that will make use of the Ethereum Network is set to grow exponentially in 2018 and beyond. But in the meantime, it’s hard to find concrete examples of how this tech can be used in clever ways. That’s why I love this here CS paper. The author describes some ways that the Ethereum Network can be used to help actual brick-and-mortar business. Specifically, the writer discusses how a frozen goods supplier can add accountability to the delivery process. This is done by equipping a cooler with temperature sensors. The sensors vote at intervals to verify that they are working and haven’t been tampered with. Then the sensors record the temperature of the cooler to the blockchain. Using such a system, both the buyer and supplier have access to the same public, trustless data. Did you know that the Ethereum Network can be used to better secure and monitor tangible assets? It’s true. That’s because data submitted to the blockchain is immutable. It cannot be changed. We can trust that the data is as it always was. Right now Developers and engineers are working on systems that will bring in a new generation of accountability. These applications are not quite ready for business and consumers yet. Soon though, the Ethereum Network will be powerful enough to handle the world’s data.